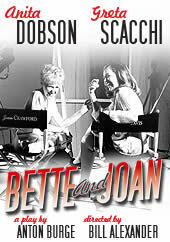 Bette and Joan is a world premiere of a new play by Anton Burge that takes place over a long day during rehearsals for the 1962 film Whatever Happened To Baby Jane. Long-time rivals, Joan Crawford asked Bette Davis to star with her in this low-budget but high risk venture as they were both experiencing considerable career lows but though ostensibly working together and more alike than either would care to admit, their bitter enmity still spilled out in a number of entertaining ways. The show is set in their separate (natch) dressing rooms, allowing them to deliver their individual monologues, remembrances and anecdotes – often remembered very differently by the two women – and also for a scene in each half where they interact, rehearsing the chair lift scene and bidding each other farewell at the end of the day. Burge’s play succeeds because it doesn’t just focus on the backstage shenanigans on the famous film, although there’s a fair bit of it in here including the wickedly played weight-belt scene, it also takes a wider view of the experience of women working in the old Hollywood system. Indeed one could extrapolate even further into the experience of all working women as the show examines the impact pursuing their careers had on their marriages, their families and the struggles they faced in a male-dominated industry. This worked particularly well for me as I haven’t actually ever seen Whatever Happened To Baby Jane (I’m a bad gay, I know) and so makes something more universal whilst still playing on the well-known legends. It is still early days for the show (I assume it was a preview as I couldn’t find when the press night was) but Anita Dobson was razor-sharp from the off and right on the money with her portrayal of Crawford, still championing the values of old-school Hollywood glamour yet her velvet glove still concealed an iron fist and a steely determination to have things done her way. Her breathy voice oozes false sincerity over her sophisticated veneer but she can’t hide the cracks as Davis’ barbs hit their mark and she can’t always get her own way as she used to and Dobson excels at suggesting the frailties behind the scenes. Her reminisces about her enduring love for Clark Gable were also exceptionally moving and she’s unafraid to show more than a little flesh, repeatedly stripping to her underwear to reveal a fine pair of pins. She was also responsible for one of the best in-character recoveries I have ever seen as her knitting fell off the stage: sheer class! Scacchi took a little longer to get comfortable in the skin of Bette Davis, a much more confrontational character and less obviously funny. She was the one taking the much more daring artistic choices and feeling the effects more than Crawford, wrapped in her (potentially slightly) delusionary cocoon, yet we don’t necessarily feel the same empathy towards her: I’m not sure if this playing up of the abrasiveness was intentional or something still being worked out but it did mean that I was firmly Team Joan from the start.